Today, Zillow launched the ability for consumers to review real estate agents they’ve worked with in the past. Millions of home shoppers visit Zillow every month, and many of them have not yet found a real estate agent to help them buy or sell their home. Access to reviews and endorsements of local agents can be an incredibly useful tool for consumers. Reviews and endorsements by past clients are a powerful tool to grow business – they’re the next best thing to a referral. Great agents will flourish with this addition. 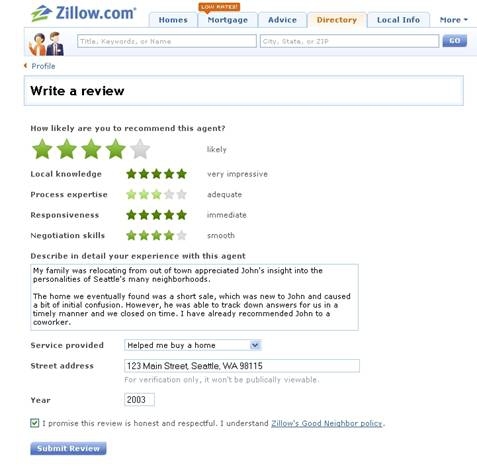 With this launch, agents can solicit reviews from past or current clients, directly from their profile page on Zillow. Zillow launched the first ever public feedback system for lenders with the launch of Zillow Mortgage Marketplace in April 2008. On Zillow Mortgage Marketplace there are 6,500 ratings and reviews for lenders, and reviews have dramatically increased their customer contacts. 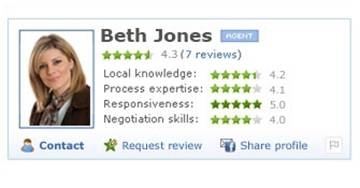 Lenders with good reviews (4-5 stars) do even better – getting twice the contacts of those with lower ratings. More than 12.5 million people visit Zillow each month. Two-thirds of Zillow visitors are buying or selling now, or in the near future. 87% of consumers would recommend or use their agent again in the future, according to NAR’s 2010 survey of buyers/sellers. Here’s a post by Sara Bonert with some additional information. You can get the jump on the new rating and reviews feature by going directly to http://www.zillow.com/reviews/request since you’re most likely very excited and motivated to get started and solicit some reviews immediately. I’ll also be hosting a training class over at ZillowAcademy.com with some additional Q&A soon. I hope you’ll check the calendar and make some time in your schedule to join us. Zillow’s goal has always been to help people make smarter real estate decisions by providing access to as much information as possible – be it home listings, home value information, comparable home sales or tools to find the best agent or mortgage lender. This launch is another step in this direction of consumer empowerment. It’s also a great way to help the agents business by making their customers endorsements available. My husband and I recently listed our condo with Grant Gibian of Caldwell Banker in Arlington, Massachusetts. Grant put forth great effort in marketing and selling our property. He called daily with status reports, i.e., open house attendance, expressed interest, feedback from agents and potential buyers. Grant returned our calls promptly and was indeed a pleasure to work with. In addition he made good suggestions and offered different options. While it was clear that the ultimate decision was ours, Grant’s experience was most beneficial. If you are considering placing your property on the market and are in the Arlington, Massachusetts area I strongly recommend that you contact Grant Gibian.